We offer an in-depth 6-day tour with your own guide and driver. The tour includes an overnight in Saranda at either end, covering the highlights of this fascinating region – three places on the tour are UNESCO World Heritage sites. The tour can be combined as a two-centre with Greece, with a week based at any of our accommodation in Lefkas, Meganissi, Parga or Sivota. We can also offer a shortened 4-day tour by missing out Tirana on days 4 and 5. This is best done as an add-on to a standard package from Corfu and the additional cost is c.£650 per person plus transfers from/to Greek resort. One week package (for two people in 2019) - Prices from £1728pp (May) to £1861pp (Aug). Notes on towns and main sites. Butrint. Ancient Buthrotum. Important and impressive Greco-Roman city, now a UNESCO World Heritage site, south of Saranda on a bluff of land half-circled by a large lake. Inhabited continuously from the 7th C BC until abandoned in 18th C. Impressive cyclopean walls and deep well within the gate, reminiscent of Mycenae – but most excavated remains are Roman. Gjirokaster. This fascinating and historic small town is also on UNESCO’s World Heritage list. Largely medieval, with some lovely architecture to admire reflecting the town’s wealthy past, it is built on a hill overlooking valley and mountains. Excellent views from the large castle above, which houses a weapons museum! Some good restaurants in the narrow cobbled lanes of the old town. Berat. Another member of the UNESCO club, Berat is called ‘the town of a thousand eyes’ because of the many-windowed old houses that crowd above the river Osrum and up the hill. High along the ridge is a 14th C citadel, its walls enclosing no fewer that fourteen small painted churches (hence the presence of the famous Onufri icon museum). The Turkish influence may be seen in the town’s three mosques and tekke, also worth visiting. Ardenica. 12th C monastery converted into an inn, it occupies the whole of a rocky outcrop amid pine and cypress trees and is a landmark visible for miles across the plain. The church, dedicated to the Virgin, is characteristically Greek, and has a magnificent iconostasis and high-quality wall-paintings. Apollonia. Another most important archaeological site. Founded in 588 BC by Greeks from Corinth, it rose to become a renowned cultural centre in the Roman period. Memorable are the elegant façade of the Bouleuterion and the great Stoa. Below stands the beautiful 13th C church of Shenmari, built out of the antique stone. Flight to Prevesa (Sunday). Transfer to Saranda and overnight. Guided tour to ancient Butrint. Visit to Blue Eye spring en route to Gjirokaster for overnight. Walking tour of Gjirokaster, including the castle and museum. Drive to Berat. Walking tour and visit to icon museum. Overnight Berat. Sightseeing tour of Tirana including the National Museum. Overnight in Tirana. Drive to historic Kruja and explore the town, castle and old bazaar. Overnight in Tirana. Turn west towards the sea. 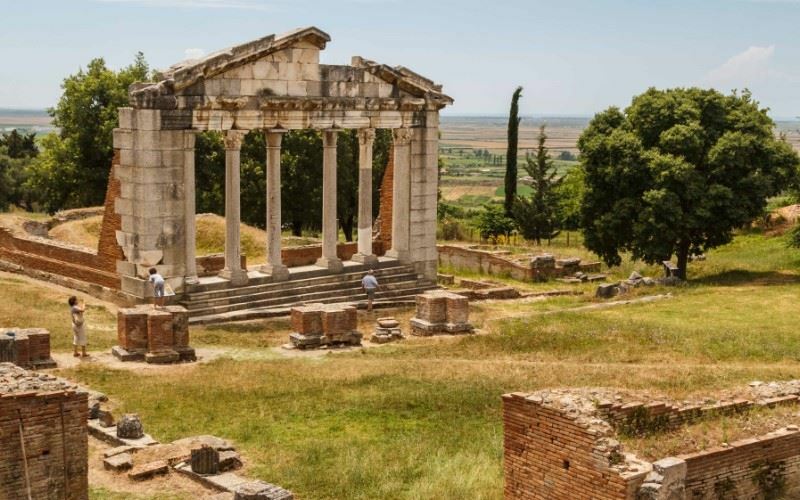 Visit Ardenica Monastery and the famous site of Apollonia. Then head south for the attractive small seaside resort of Himara for overnight. Enjoy a well earned morning's R&R - perhaps a swim from Himara's splendid beach. After lunch a scenic coastal drive along the Albanian Riviera to Saranda for overnight. Transfer to Prevesa Airport or to a Greek resort for your second week.